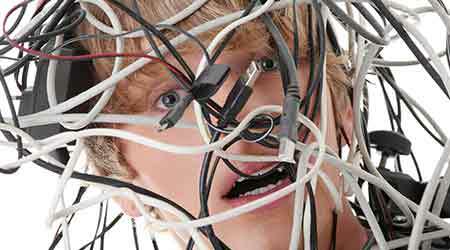 Avoid getting tangled up in cabling and wiring issues in your office. Take these tips. Generally even the smallest offices are set-up with phone, data (internet), and some level of monitoring system. More complex buildings may have more robust IP-based audio-visual systems along with IP-based building automation systems that monitor and control heating, ventilation, air conditioning (HVAC); energy management systems; lighting, window, and shade controls; digital signage; and that can also interface with security systems such as access control systems and video surveillance. What is one common connection between them all? Cables! They all communicate or transmit via structured cabling platforms. If all of these systems make up the organism of your facility, then think of cable design as the arteries. And when these arteries get blocked or broken, or the facility just needs cosmetic surgery, a well-designed cabling platform can make all the difference. While not as interesting or fun as the fancy network components, cabling is much more likely to outlive the hardware it’s connecting. That’s good news because it can also become the most difficult and potentially costly component to replace. This is a good reason to consider not only the initial implementation costs when starting your project, but subsequent costs as well. The technology industry has evolved over the years, but so has the cabling industry, paving the way with best practices. Here are six key principals of cabling design and installation to keep in mind. Keep all cable runs under 90 percent of the maximum distance supported by each media type (i.e., copper, fiber, and coaxial cables) and as specified in the applicable standard. This extra headroom is for the patch cables that will be required for the end-to-end connection. Avoid over-bundling the cables or placing multiple bundles on top of each other. Doing so can degrade performance of the cables underneath. You should also avoid placing copper cables near equipment that may generate high levels of electromagnetic interference. And be sure to keep fiber and copper runs separated, because the weight of the copper cables can crush any fiber cables that are placed underneath. Finally, when using mix-and-match cables and multi-manufacturer components, be sure to comply with the strictest of the manufacturer specifications so you meet 20-year permanent link warranty. When cables are being laid, pay close attention to the conduit-fill ratio; overfilled conduits can potentially become fire hazards or damage the cables. A good rule of thumb is to not exceed 40 percent of the pathway cross-section area. A related point should go without saying: Installers should follow local code, industry standards, and manufacturers’ guidelines on bend radii and maximum pulling tension during installation. Have at least one telecom room per floor, with all cables serving that floor terminated on the telecom room in the same floor. Larger floor spaces may require more than one telecom room depending on floor size. Benefits of having one telecom room per floor include limiting the cable length distance required, which has direct impact on cable performance and facilitates easier troubleshooting by narrowing the number of telecom room supporting the space. Plus, if your facility decides it needs a change to only a single floor, it will save some headache and expense of doing so. While you’re at it, be sure to provide adequate working clearances inside telecom rooms both in the front and back. In some cases, back of rack clearances can be eliminated by using swing out racks. Closely coordinate cable pathways for both network cabling and power with the furniture vendor and architect. It’s also important to coordinate outlets for both electrical and network devices. Be sure to plan space for additional end-user add-on devices and cables (cell phone, USB cords, HDMI cables, patch cords, etc. ), and avoid dangling cables by providing trays, pathway, grommets, etc. And carefully plan the cable transition from the building (e.g., walls, columns, ceilings, floors) to the furniture systems. This is a very important step and should not be skipped. Obtain as part of the close-out submittal process a completed diagram, floor layout with label identifications, cable types and patching information. Keep the as-built display in your telecom room, and keep a record of all changes along the way. Test all cables from end-to-end throughout the process and again at completion of the installation. Any cables that are relocated or terminated after testing should be retested. Label each cabling component uniquely to make them easy to identify. Effective labeling promotes better communication and eliminates confusion when someone is trying to locate or troubleshoot a component. Gislene D. Weig (gweig@plannet.com), electrical engineer, RCDD, is a senior consultant at PlanNet Consulting, where her core business involves U.S. and Latin American markets focused on large-scale projects that include voice/data, wired and wireless communication systems, and data network design.